Several Florida women volunteers are lining up to do laundry for the hard-working linemen repairing the power grid in Highlands County. This wouldn't have been possible without Laurie Hurner who is a citrus agent in Highlands County with the University of Florida Institute of Food and Agricultural Sciences Extension. Her job requires her not only to be an expert in citrus but also an expert at networking. And in the wake of Hurricane Irma, her many relationships in the community have been key to assembling volunteers and gathering donations to help county residents in need. Hurner helped connect county linemen who don’t have access to laundry facilities with roughly 100 community volunteers who have donated time, quarters and detergent to keeping their work clothes clean. "The saying 'sometimes it's not what you know, but who you know' is an old piece of wisdom that has never been truer," Hurner says. 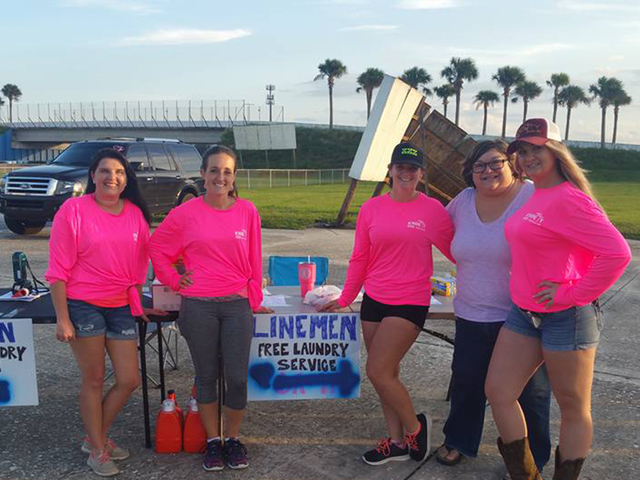 Volunteers will be at the Sebring Raceway (113 Midway Dr, Sebring, FL 33870) from 6 p.m. to 10 p.m and at the laundry mat in Lake Placid from 10 p.m. to midnight on Tuesday to continue helping the linemen.